Adding IP control to your garage doors is a great little home automation project for a wet weekend and it really shows the power and simplicity of Indigo. The easiest way to interface to most garage doors is through their manual push button control. These are usually securely inside the property and using them removes the need to try and link up with the more complicated and potentially less reliable wireless operation of the doors. 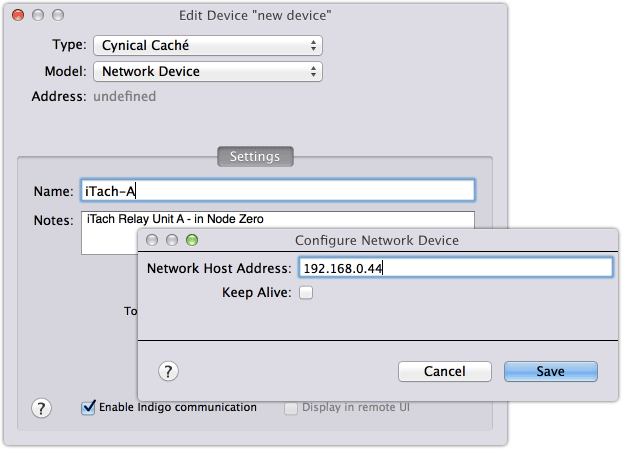 Indigo supports many relay controllers via its 3rd party plugin program and we chose to use the Global Cache IP2CC iTach TCP/IP to Contact Closure which provides a set of 3 relays to activate devices over your network and via the Internet. Our’s is the Ethernet version pictured but it is also available in Power over Ethernet (PoE) and Wi-Fi versions too. Next we added the Cynical Caché Plugin from ‘Perry The Cynic’ to our Indigo system. Installation is as easy as un-zipping and double-clicking the downloaded the file. Like wise, setup is simple starting with the addition of a new device. Choose ‘Cynical Caché’ from the ‘Type’ drop-down and ‘Network Device’ from the ‘Model’ list. Name your device and hit the Edit Device Settings button. Here you enter the IP address of your IP2CC unit. There are 3rd party Mac versions of the iHelp, iLearn, iTest, and iConvert Global Caché utilities here that you can use to find the IP address of your unit. Next create a new Action Group that you can call on to operate your doors. Choose the correct item from the three relays and have it turning on with an auto-off to simulate pressing your garage door button. Although the screenshot above shows a 1 second interval we found setting it to 2 seconds gave more reliable operation of the doors. Safety & Security – We’ve had sensors fitted to our garage doors since installation that interface directly to the doors motor control unit. These prevent the doors from starting to close if there’s something in the way and if anything breaks the beam while they are descending then they’ll reverse. This gives some peace of mind with a potentially dangerous piece of automation, you don’t want to come home and find your cat either side of your garage door! We’ve purchased these Z-Wave garage door sensors that will provide us with status of the door position and we’ll be covering fitting them in a future post. For now though our garage doors can be operated from our iPhone using the Indigo Touch App and we have the feed from the camera inside the garage on the same screen too so we can monitor it. Being able to open the doors when you’re in view of the house when driving home, rather than having to waiting to be within RF range of the old controller is a nice update. Add to that the ability to do it from anywhere in the world with Internet Access and you have an inexpensive but useful smart home upgrade. 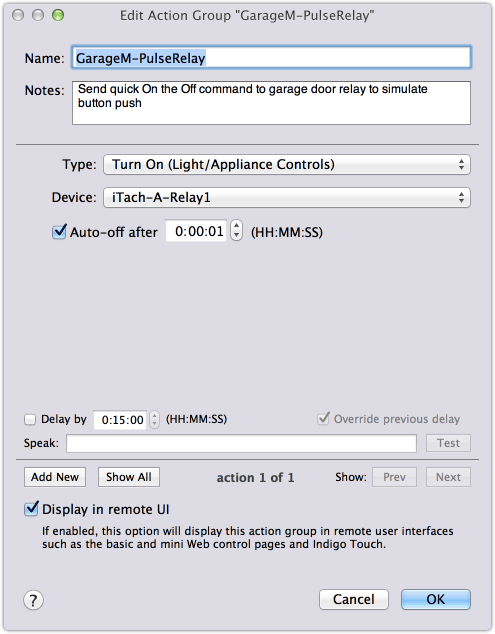 Now read Part 1 and Part 2 of this Home Automation on the Mac series. 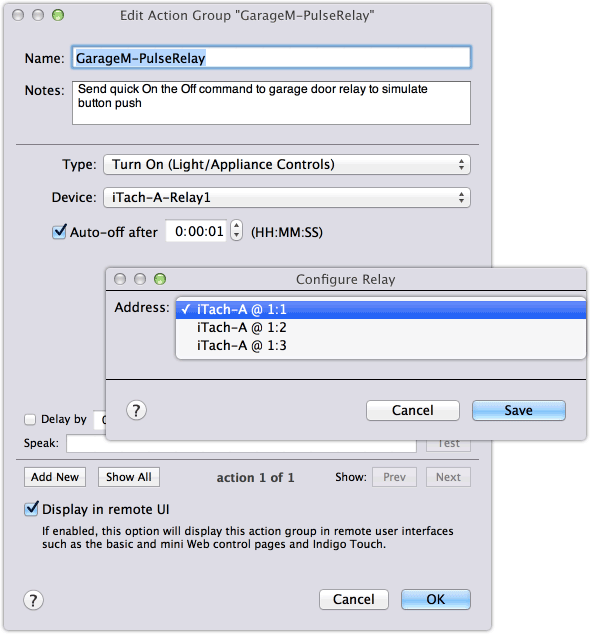 1 Comment on "Indigo: Home Automation on the Mac – Part 3 – IP Garage Door Control"
Your product is good, i want a training so that i can promote the product. How can i get a training manual from you?